People recently punished in China's campaign against online rumors include those who circulated an inflated death toll in the Tianjin blasts and who alleged a man committed suicide because of the country's stock market woes, state media reported Monday. The official Xinhua News Agency said 197 people have been punished in a special campaign, citing the Public Security Ministry, but did not say over what period. Authorities over the past two years have waged a campaign to purge rumormongering from the Chinese Internet, saying that unethical and unbecoming behavior online needs to be wiped out. Critics say the campaign also is aimed at suppressing criticism of the ruling Communist Party. Xinhua cited the ministry as saying that 165 online accounts were closed in the campaign's latest phase. 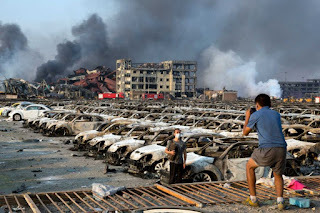 Among the rumors circulated were that a "man jumped to his death in Beijing due to the stock market slump," and that "at least 1,300 people were killed in the Tianjin blasts." The death toll in the Aug. 12 explosions at warehouses for hazardous chemicals in the port city so far is 150. The ministry also said some of the people were punished for spreading seditious rumors about upcoming commemorations of the 70th anniversary of the end of World War II, which China marks on Thursday with a big military parade through Beijing.